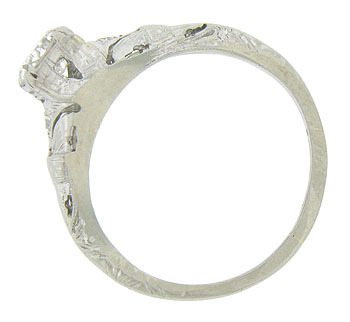 Intricate engraving and organic cut-work adorn the sides and shoulders of this exquisite antique style engagement ring. The elevated center mount is set with a .55 carat EGL certified, F-G color, Vs2 clarity, round cut diamond. 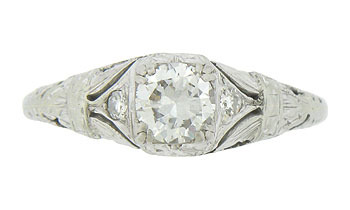 Single, fine faceted diamonds are set into the rings shoulders. 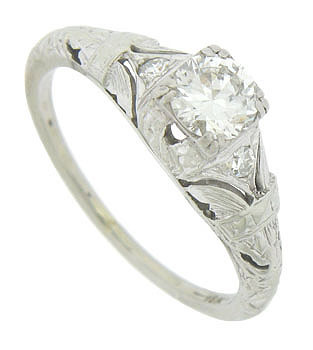 This splendid ring is fashioned of 18K white gold and measures 6.58 mm in width. Size 5 3/4. We can re-size.